Description: This camp is open to rising 6th-12th grade boys and girls of all skill levels. Our striker / goalkeeper camp will allow players to improve their technical skills and tactical awareness in front of goal. Players will engage in a competitive yet fun training environment with a high level of coaching. The camp will be led by head coach Darren Ambrose and assistant coach Kelly Keelan. Ambrose has 18 years of coaching experience and his teams have been known for their standout defensive efforts. He mentored Kalijah Terilli to a first team All-Ivy League selection in 2013. In 2011, Penn set a school record for allowing just seven goals all season and led the nation in shutout percentage. A former goalkeeper at USC Spartanburg, Ambrose was selected as the Adidas National Player of the year in 1992-93. He was inducted into the USC Spartanburg Athletics Hall of Fame in 2002. Keelan has eight years of experience at the Division I level, primarily coaching the goalkeepers. 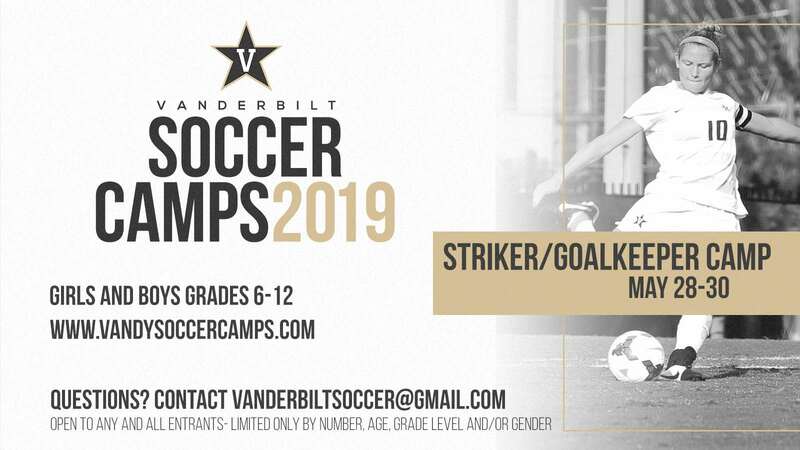 While at Vanderbilt, she has worked a skilled group of goalkeepers. Kaitlyn Fahrner led the SEC in save percentage in 2017 and led the league in saves per game in 2016. In 2015, the Commodores allowed 23 goals, the fewest since the 2006 season. In her lone season at Georgetown, she coached All-Northeast Region and All-BIG EAST second team goalkeeper Emma Newins. A four-year standout at George Mason, Keelan played both goalkeeper and forward for the Patriots. She was a team captain and named to the All-Colonial Athletic Association team. In 2008, Keelan led the Patriots in goals, points, saves and shutouts. » 15% discount off original price, per player for Vanderbilt Employees - has to provide valid Vanderbilt email address when registering to receive discount.